DONETSK, Ukraine -- Eastern Ukraine has witnessed the worst clashes since the Minsk ceasefire deal was brokered in February. 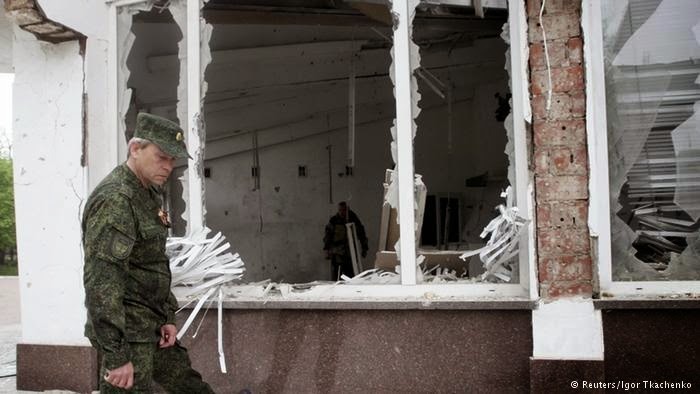 European observers continue to call for peace amid ceasefire violations by both parties. "A Ukrainian soldier was killed and six others wounded over the last 24 hours," Andy Lysinko, Ukraine's military spokesman, said at a news briefing on Sunday. Lysneko added that the rebels used large-caliber artillery in violation of the Minsk protocol. The shelling of Donetsk, considered the separatists' central hub, has resumed following weeks of calm, leaving at least six rebels wounded, the separatists' official website reported. The intensified clashes follow the one year anniversary of unrest in Odessa that left more than 40 pro-Russia rebels dead in May 2014. European observers continue to call for peace and restraint, citing continued violations of the "fragile" ceasefire by both parties. Conflicting reports on the deployment of a peacekeeping mission in eastern Ukraine emerged last week. The Ukrainian presidency said Russian President Vladimir Putin was open to the deployment of peacekeeping forces in eastern Ukraine on Thursday. "In the context of the discussion of ways towards a peaceful resolution (of the conflict), President Putin has accepted the possibility of deploying a peacekeeping contingent to the Donbass region," a statement from the president said. However, Russian officials denied the claims on Friday. "Before the text of the Minsk agreement and its concrete points are implemented we believe that it would be absolutely wrong to raise any other issues including that about peacekeepers," Dmitry Peskov, the Kremlin's spokesman, told Russian news agencies on Friday. Peskov added that it is not Russia's place to decide on a peacekeeping mission in the conflict-torn region since it is not a party of the conflict. The conflict has killed more than 6,200 people in the past year with more than a million displaced, according to figures released by the UN.